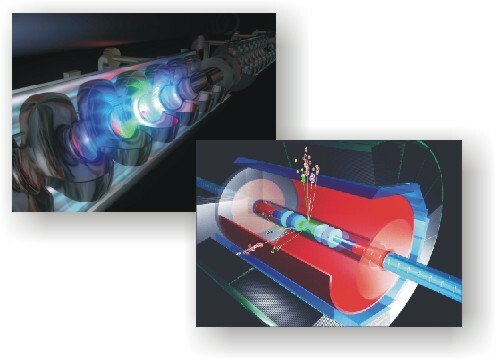 Graphics from DESY ILC site showing electromagnetic fields in the superconducting accelerator cavities and an event display for a proposed detector. The ILC is a soon-to-be-proposed e+e- linear collider with a center-of-mass energy ranging from 500-1000 GeV. This machine is complementary to the LHC and will be an essential tool in our struggle to understand the mechanism of electroweak symmetry breaking. Manly was very active on this project in the mid-90's acting as head of software and simulations for the U.S. Physics Studies on the Linear Collider. Due to the demands of PHOBOS work, the effort on the ILC was dropped for a time. Hopefully we can begin working on it again soon. SLD was a large full-coverage particle physics detector situated at the collison point of the Stanford Linear Collider (SLC) at the Stanford Linear Accelerator Center (SLAC) in Stanford, California. The SLD collaboration was formed in approximately 1982. After 9 years of design, R+D, and construction, SLD took its first data in 1991 and last data in 1998. The purpose of the SLD experiment was to make detailed studies of the decay of Z bosons, which were created when the electrons and positrons accelerated by the SLC collide (at 91 GeV in the center-of-mass). SLD made substantial contributions to our knowledge of electroweak, heavy quark, and QCD physics. The experiment made the single most precise measurement of the electroweak mixing angle and produced many inclusive heavy quark results (lifetimes and asymmetries) that are more precise than any comparable measurement. For more information about SLD, check out the SLD website. A Z decay as seen by the SLD detector (click to enlarge). Steve Manly joined SLD in 1985 as a graduate student and continued to be heavily involved as a faculty member at Yale along with the SLD co-spokesman, Charlie Baltay. He was the SLD commissioner (project manager) in 1993 and 1994. The following graduate students earned Ph.D.'s with the Yale group between 1988 and 1999: Jeff Turk, Ram Ben-David, Jeff Snyder, Sumit Sen, Ming Liu, and Thomas Moore. Most of the work was in the areas of heavy quark tagging, inclusive vertexing, and particle-antiparticle mixing. The Yale group was involved in the construction of the endcap liquid argon calorimeters (while still at Columbia), endcap Cerenkov ring imaging detectors, and the CCD vertex detector. The SLD activity at Rochester was minimal at because Manly was ramping up his effort on the Phobos experiment when he moved to Rochester in 1998.